She was a former employee of Bob Evans Manufacturing and of the Baptist faith. She was the matriarch of a very large, respectable family. Her marriage to Edward Riddle endured a significantly notable 70 years, until his death on August 25, 1971. 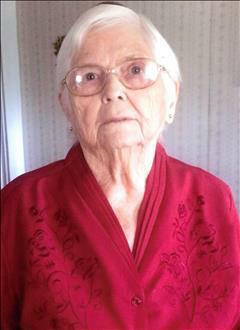 Ruby Riddle, age 86 of Burkesville, KY passed away on Monday, April 30, 2018 at Cumberland County Hospital, Burkesville, KY.
Funeral service will be at 2pmCT, Thursday, May 3, 2018, at Ballou & Stotts Funeral Home, 304 N Main Street, Burkesville, KY with burial in Modoc Cemetery. The family requests visitation 1pm-9pmCT, Wednesday, May 02, 2018 at Ballou & Stotts Funeral Home. Ruby was born on April 07, 1932 in Cumberland County, KY. She was the son of the late Frank Alvin and Lillie Francis Hoots Hickey. She died Monday, April 30, 2018, in Burkesville, Cumberland County, KY, at the age of 86 years, 23 days. She was a former employee of Bob Evans Manufacturing and of the Baptist faith. In addition to her parents she was preceded in death by her husband, Edward Riddle; one daughter, Linda Riddle; one son, Richard Riddle; six sisters, Minnie Lonas Hickey, Bernice Groce, Zelma Groce, Mary Riley, Virgie Jennings, and Inis Marie Hickey; and four brothers, Walter Hickey, James Hickey, Culbert Flowers, and Jonah Ruel Hickey. Expressions of sympathy may take the form of a donation to the Modoc Cemetery Fund c/o Billy Garner 311 Garmon Ferry Rd, Burkesville, KY 42717 or may be left at the funeral home. Ballou & Stotts Funeral Home, 304 N Main Street, Burkesville, KY, is in charge of arrangements. 2018-05-01 - 304 N Main Street, Burkesville, KY - Photo from Ballou & Stotts Funeral Home.